Whether you're an architectural enthusiast, a sun-worshipping beach bunny or an exploring foodie, Barcelona will capture the hearts of all. Following on from my last post which gave a snapshot guide to all things Food & Wine, I have compiled a list of places to see while visiting the twinkling lights of Spain's famous coastal city. I first visited Barcelona in 1998. My school buddie and I had endured weeks of practice with the school choir just so we could land places on the coveted trip to Spain. 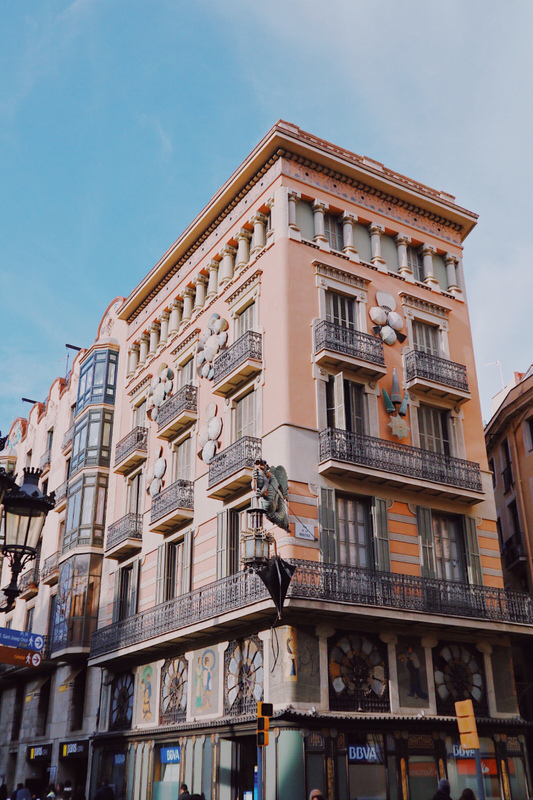 We sang our 13-year-old hearts out in small town squares and sleepy beachside promenades (those poor locals) before being granted a few hours of free time to see the historic sites of Barcelona. I can tell you that a lot has changed in 20 years! Scroll down to read my rough guide of how to wander the pretty streets of BCN. Barcelona Cathedral - This spectacular gothic cathedral, dating back to the 13th century, is by far the prettiest in the city (well, I think so anyway). Sagrada Familia - The crown jewel of Barcelona! Gaudi's most famous work to date and 150 years later, it's still not complete! People are divided on its modern architecture but make your own decision by booking tickets in advance to jump the queues. La Boqueria Market - Located two thirds up La Rambla, one of Europe's largest food markets offers anything from freshly squeezed juices, meats, cheese and fish. Open Monday to Saturday (handy tip: head to the back to find a lovely tapas bar where you can watch the world go by), you're guaranteed to have a memorable experience. Gothic Quarter - Be prepared to get lost amongst the beautiful backstreets of this former Roman village where you'll find a plethora of trendy bars and Catalan restaurants. This old city of Barcelona is also home to local artisans selling jewellery, leather goods and artwork. Park Guell - Set on the outskirts of the city with views to the ocean, this park was one of the major works of Gaudi. Booking is advised and try to get their early to avoid the tourist crowds. Port Vell/Barceloneta - A bustling area in the port with restaurants looking out to the impressive line-up of superyachts. The beautiful sandy beaches are awash with varying sand sculptures and all-year eateries. Cowshed Relax - Hidden in the basement of Soho House, the tranquil spa is the perfect escape from the busy scenes above. We booked a massage and zoned out to the calming ripples of the indoor pool. Poble-Sec - We came across this area when having dinner at Malamén. It's It's much more relaxed with trendy bars and small restaurants. The wonderful find was the drinks coming at half the price of central Barcelona. For those who were wondering about accommodation, we stayed at Hotel Espana which I'd highly recommend if you're looking for a lovely boutique hotel in the midst of the action. It also has a rooftop terrace and pool for those summer months. If you're looking to splurge, without doubt, book into Soho House. It's still close enough to local amenities without having to get a taxi everywhere. If you're a fan of tapas, cava and sunshine strolls, please check out my previous posts on Javea, just a few hours down the coast. Let's start with a cocktail at the Siesta Bar!